Style offers a variety of classes for all ages and levels. We have something for YOU! Our Mommy & Me class is the perfect class for ages 18-36 months. This 45 minute class allows children to discover the excitement of dance and share a special time between mother (or father) and child. Our Mommy & Me class gives children the opportunity to stretch, play games, interact with others, and build motor skills while being introduced to basic dance concepts and movement with the security of mom (or dad). Students may wear any comfortable clothing. Shoes are not required. *Mommy & Me students are invited to participate in our recital. Our Tot Program is a 45 minute class geared for children ages 2-3. Tot Dance classes are combination classes that include ballet, jazz, and creative movement with emphasis on fun. This class allows the younger dancer to get a taste of many styles of dance. All movement, music, and activities are age appropriate. Tot Gymnastics classes introduce the young students to basic floor tumbling while gaining flexibility, strength, and motor skills. Students in our Tot Program may wear any style or color of leotard or dance outfit. Ballet slippers may be worn in dance class. Hair should be secured away from face. *Tot Dance students are invited to participate in our recital. The Style Mini Movers program is a 45 minute class for students in Pre K-K. This is a combination class including a slightly more advanced level of ballet, jazz, and creative movement. Mini Movers is a great way for the young student to explore many styles of dance. All movement, music, and activities are age appropriate. Dancers may wear any style or color of leotard or dance outfit. Ballet slippers or jazz shoes may be worn in class. Hair should be secured away from face. *Mini Movers students are invited to participate in our recital. Style offers a high quality of classical ballet training for students beginning through advanced. Each level is taught in a systematic method of instruction. Ballet students must wear any color or style of leotard, ballet pink tights, and pink ballet shoes. Hair must be secured in a neat bun. Jazz is a fun, high-energy class offered to students of all levels. Dancers are exposed to a variety of different jazz styles and techniques. All movement and music is age appropriate. Jazz students may wear any color or style of leotard or dance outfit. Jazz shoes are worn in class. Hair should be secured away from face. Tap is an exciting rhythmic dance form for children and adults. Style offers tap classes for beginning through advanced students. Students will enjoy creating rhythms with their feet and body. No baggy clothing. Tap shoes are worn in class. Hair should be secured away from face. Style offers Hip Hop for beginners through advanced students of all ages. Students love this fun and exciting style of dance. We teach a variety of up-to-date hip hop styles that are age appropriate. Students may go barefoot or wear tennis shoes and comfortable clothing. No jeans, please. Floor gymnastics is offered for beginners through advanced students. With a significant amount of instructors per class, students work at their own pace and receive quality one-on-one time with the instructors. Students will primarily focus on floor tumbling skills while gaining flexibility and strength. To ensure the safety of the students, gymnasts should wear a leotard, gymnastics outfit, or tight fitting clothing. No baggy clothes or socks permitted. No shoes are allowed in the gymnastics room. *Gymnasts will participate in our Gymnastics Spectacular in June. They do not participate in the recital. We are excited to offer Acro Dance for beginners through advanced students. Acro Dance is a style of dance combining floor gymnastics with dance technique. Students will gain flexibility and strength while focusing on blending dance and gymnastics. To ensure the safety of the students, students should wear a leotard, gymnastics outfit, or tight fitting clothing. No baggy clothes or socks permitted. *Acro Dance students will participate in the recital. Style offers adult dance/fitness classes at both locations. Click on the link above for more information! Style offers a fun and exciting pom & cheer gymnastics program for those students interested in gaining gymnastics and cheerleading skills. Students in this class concentrate on motions, jumps, cheers, chants, stunts, pom, and gymnastics. This is a great class to prepare students for recreational or competitive cheerleading. To ensure the safety of the students, students should wear a leotard, gymnastics outfit, or tight fitting clothing. No baggy clothes. *Cheer students will participate in the recital. 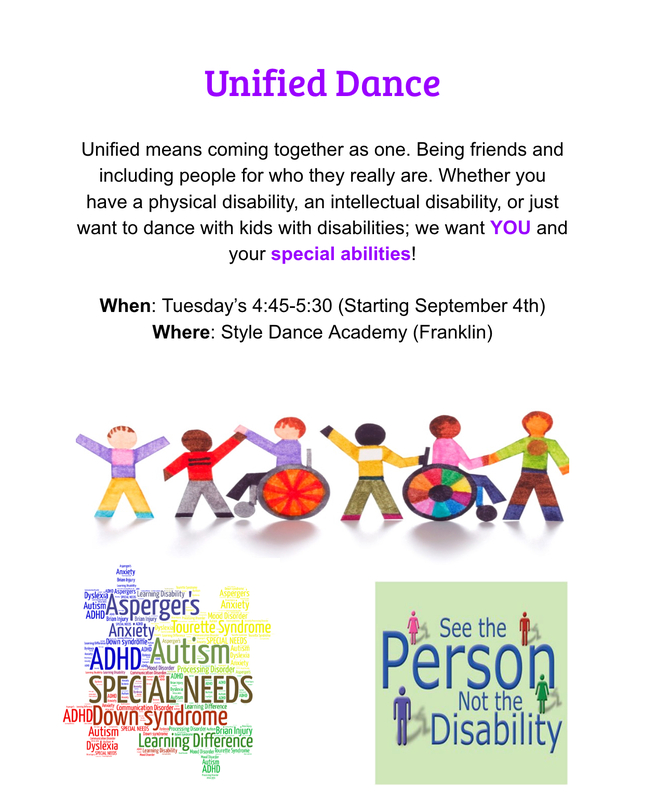 We are extremely excited to begin a NEW Unified Dance program at our Franklin location! Click on the link above for more information.